Awesome action figures from the classic Batman 1966 TV series! Set contains 4 fully articulated Mego-style action figures. You'll get Batman, Chief O'Hara, Batgirl, and Barbara Gordon - all measuring 8-inches tall! Celebrate the classic Batman 1966 TV series with this great collection of retro style action figures! 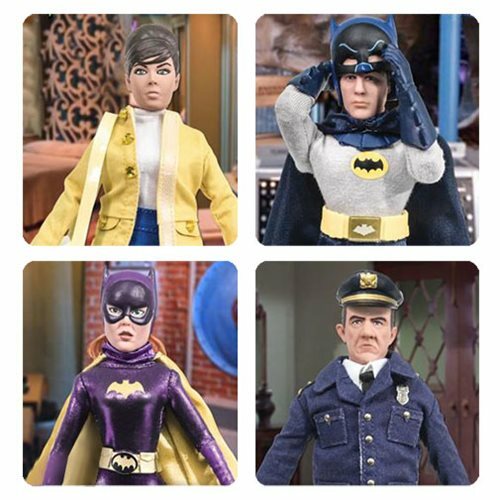 The Batman 1966 TV Series 5 8-Inch Action Figure Set includes 4 action figures made to look like some of your favorite characters from the hit series. You'll get Adam West's Batman, Stafford Repp's Chief O'Hara, plus Yvonne Craig's Barbara "Batgirl" Gordon! Each action figure measures approximately 8-inches tall and includes over 15 points of articulation. Ages 8 and up.